Do not forsake me oh my darling. Whenever we hear this we get deeper and deeper into Kane’s mind and psyche. A profound achievement for a 1952 western. Is this song about him leaving the town of Hadleyville; his newly wedded wife leaving him; his friends neglecting his call to arms; or his past recollections of his finer days as the town’s marshal? Director Fred Zinnemann allows High Noon to somehow encompass all of these possibilities during its 85-minute run-time. High Noon takes place almost entirely in real time. Meaning, its run-time coincides with the exact time of the film’s narrative. Zinnemann places a huge emphasis on clocks. Whenever he can he highlights multiple timepieces throughout, drawing his camera closer to them or lingering on them for an extra few seconds. Like the film’s haunting tune, exact timing comes to dominate as well. In 85 minutes we will see the potential demise of a man’s renowned legacy that took him many decades to construct. Picking up at about 10:40am, smack in the middle of the marriage ceremony between Kane and his wife Amy (Grace Kelly), High Noon doesn’t waste any time getting us acquainted with what’s going on. The direction here is tight and taut. This is the last day Kane will be the town’s marshal. He plans on leaving Haddleyville to start his life in Las Vegas with Amy. Immediately after the wedding, he’s greeted with a telegram warning that a man he once put away in prison five years ago is now free and seeking revenge. Urged by his friends to leave and not look back, Kane is torn, quickly realizing that he’s still marshal for one more day. Leaving would undoubtedly wreck his reputation. He has a supreme conscience that suffocates him enough to decline the incessant pleadings of his wife. She wishes that he leave with her and ignore the violence (she is a Quaker). She must not know Kane. The clock ticks closer to noon. We see Kane pacing up and down the empty dirt roads from a birds-eye perspective, beautifully shot in black & white by cinematographer Floyd Crosby. No doubt is Kane contemplating his decisions to stay, but also he’s somewhat frightened and confused as the town’s mayor (Thomas Mitchell) and his former deputy (Lloyd Bridges) are ready to bail on him when they hear an enemy is coming for revenge. The majority of the people are either at Sunday church, a saloon, or in a hotel. Kane frequents these places to ask for help. He gives a motivational speech at each place (other actors hardly convey Cooper’s effortless decency and virtue), but he always leaves with no extra men behind him. It’s only him facing that noon train that’s carrying Frank Miller (Ian MacDonald). His three bandit friends (played by Lee Van Clef, Robert J. Wilke, and Sheb Wooley) are impatiently awaiting the arrival of that train at its station. It’s famously said that director Howard Hawkes didn’t agree with High Noon‘s ideas. He believed that Kane shouldn’t be seeking the help of the townsfolk. In response he made Rio Bravo, a western starring John Wayne and Dean Martin about unbreakable camaraderie within the law enforcement. It turns out Kane will have no one and when that train arrives, it will be four on one. 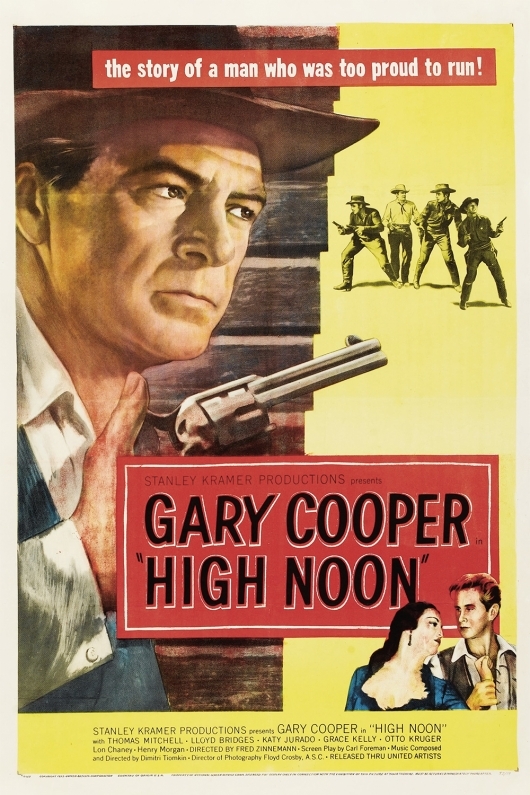 High Noon came out during the height of Senator Joseph McCarthy’s scandal and problems involving House Un-American Activities Committee (HUAC). That’s probably not a coincidence. Written by Carl Foreman and based on the magazine story The Tin Star by John W. Cunningham, the film may have been intended to be an allegory about the Communist hunt going on in Hollywood during the early 1950s. Watching the movie with this in mind one can perceive that nobody wanting to be involved with Kane mirrors the mindset of those involved in the real-life trials. They shun Kane away when Frank Miller and his posse come into town. All are there for Kane’s wedding. When things get tough, though, nobody feels gutsy enough to claim they know Kane, let alone fight with him. It’s almost as if the town is hardly good enough for Kane’s presence there. The look on Cooper’s face says it all. He rightly won the Oscar for Best Actor for his performance. 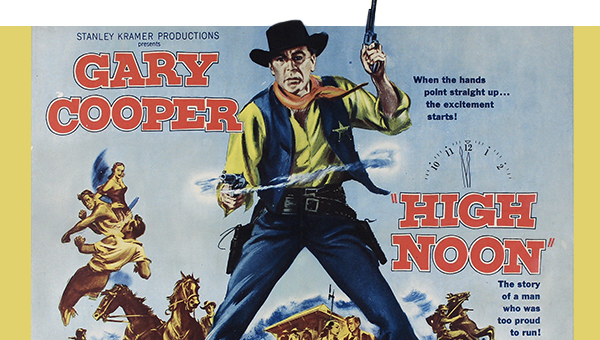 Whatever its intent was High Noon has become a well revered western that has attained classic status, winning multiple Oscars (including best Original Song and Best Editing), and is frequently imitated by many subsequent westerns. Not content with only having its sights set on the concept of time, analyzing cowardice, being haunted by one’s conscious, or trying to preserve one’s virtuous image, High Noon seems to be ruminating on something much larger. By the film’s end, after its glorious shootout sequence taking place during the last twenty minutes between Kane and Miller and his men after Kane says so long to a past lover (Katy Jurado) and hello to his future lover, Zinnemann has an impulse to wrestle with the Wild West itself. In one of the greatest last shots in cinema history, a badge is carelessly tossed to the dirt road. This is a shock. It’s an unethical ending when it comes to westerns because so often that badge is seen as being sacred. Not to Kane. Do not forsake me oh my darling. Maybe it’s the badge singing the tune and longing for the day it’s worn by another man as honorable as Kane was.